Alexander Weekend tickets are now on sale! The Alexander Weekend, March 25-27, 2011, celebrates the 10th anniversary of the Palm Springs Preservation Foundation’s inaugural event in 2001 that first recognized the Alexander Construction Company’s significant contributions to modernist residential architecture in Palm Springs. In conjunction with its first Great Alexander Weekend, the Palm Springs Preservation Foundation published a tribute journal entitled When Mod Went Mass: A Celebration of Alexander Homes. The weekend and tribute journal launched a growing appreciation of the seminal role the Alexander Construction Company played in the creation of Palm Springs’ “built environment.” It also brought to the forefront the architectural importance of those Alexander-built tract homes designed by architects William Krisel and Donald Wexler. This year, a new commemorative tribute journal devoted to the Alexanders is entitled The Alexander: A Desert Legacy and written by architect/author Jim Harlan. The Alexander Company, founded by George Alexander and his son Robert, was a Palm Springs based residential development company that built more than 2,200 homes in the desert between 1947 and 1965. The “Alexanders,” as these homes are now known, doubled Palm Springs residential population, giving the city a whole new shape and direction. www.wikipedia.org/wiki/Alexander_Construction_Company. Key to the Alexanders’ success was the talented young architect Krisel, partner in the Los Angeles firm Palmer and Krisel, Inc. and a close friend of Bob Alexander. www.psmodcom.com/Architects%20pages/PalmerKrisel. The Alexanders’ foray into desert tract homes began with Twin Palms Estates, named for two palm trees included in the front landscaping of each home. Hallmarks were a single story, open floor plan with an indoor-outdoor feeling enhanced by skylights, sliding glass doors, and an interior atrium. Three quarter walls divided the main room to provide abundant light, eliminating the need for full framed walls, molding and trim, so created a clean contemporary look. Exposed tongue-and-groove planks and beamed ceilings also enhanced the room’s soaring architectural lines. The same floor plan repeated within the housing development saved construction and materials costs. Krisel was involved with every facet of design, planning, engineering and construction. From site and landscape choices to interior colors and trim, each house was oriented and embellished differently, making the Alexanders look like a collection of individualized custom homes. Other Palmer & Krisel projects included the Ocotillo Lodge, Vista Las Palmas, Racquet Club Estates, Sandpiper condominiums in Palm Desert, and the famous “House of Tomorrow” also known as the “Elvis Presley Honeymoon Hideaway.” Robert Alexander and his wife lived in this house for a time, featured in Look Magazine in September, 1962. From as early as the 1920s and through the 1970s, an impressive roster of talented architects have been captivated by Palm Springs: R.M. Schindler, Richard Neutra, and Lloyd Wright (Frank Lloyd Wright’s son); young Swiss architect Albert Frey whose work profoundly influenced desert architecture; and regional modernists William F. Cody, E. Stewart Williams, Wexler and Krisel. Each made their mark with “striking custom homes, impressive commercial complexes, hotels and motels, commanding civic and educational campuses … and created an architectural treasury of great consequence and innovation in and around Palm Springs,” writes Robert Imber in his story on The Alexander Homes. www.eichlernetwork.com/desert_chron1.html. Imber noted that Palm Springs remained a sleepy seasonal village until postwar American affluence and growing families began to emerge with a demand for mass market housing. Coupled with the fact that Palm Springs already was a discrete playground for Hollywood’s elite, a bevy of builders and architects grew to fill the increasing demand for year round residential and well as seasonal vacation homes. The Alexander Weekend includes a free Kick Off event with Jim Harlan’s lively, entertaining overview of the Alexander Construction Company’s post-war housing stock in Palm Springs on Friday, March 25, 6 – 7:30 p.m. at the Canyon Conference Center. Panelists include architects Krisel and Wexler along with author Alan Hess and architect/author Patrick McGrew discussing the lasting impact the Alexanders made on Palm Springs post-war building boom. Join Honorary Chair Jill Alexander Kitnick at the Opening Night Cocktail Party on Friday, 8 to 10 p.m. and be among the first to preview the new tribute journal. 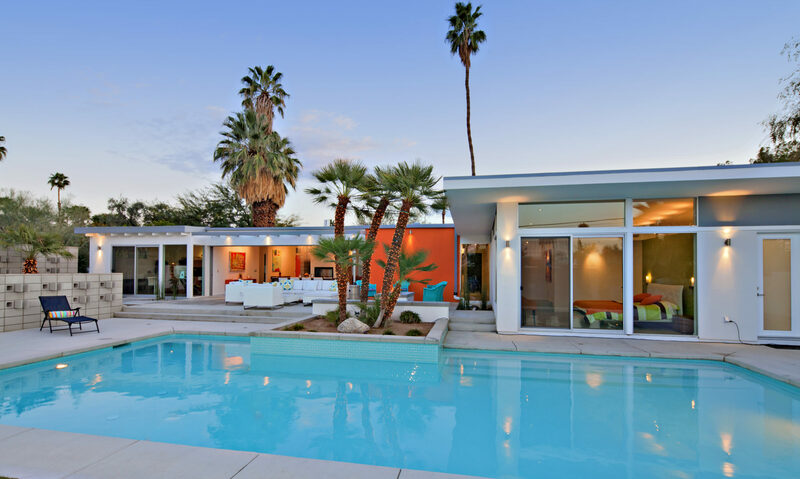 The party will be held in a Krisel-designed “long butterfly” home in Twin Palms, an example of the Alexanders’ early work that has never been open to the public. A specialty cocktail has been created to celebrate the event. The Alexanders had five distinctive rooflines: The classic butterfly; a flat roof with side or front entry; narrow gabled roof with front or side entry; wide gable roof; and side gabled roof with clerestory windows. Modernist Home Tour I on Saturday, March 26, includes two of the Alexander Construction Company’s most important modernist neighborhoods, Twin Palms and Vista Las Palmas, showcasing fine examples of mid-century residential architecture including “Butterfly,” “Swiss Miss” and other Alexander rooflines. www.eichlernetwork.com/desert_chron1.html. The tour also includes the “House of Tomorrow,” considered one of the most innovative modernist residences built at that time. Tour times are from 10 a.m. to 6 p.m. and includes a one-hour lunch break. www.elvishoneymoon.com. Harlan will be on hand to sign his new book at Just Fabulous bookstore, 515 N. Palm Canyon Drive, during a complimentary book signing from 3 to 5 p.m. The opening night cocktail party is $50 per person; Modernist Home Tour I is $85 and Modernist Home Tour II is $45. The AW multi-pass option at $165 offers the best value and includes the exclusive Friday night cocktail party and two full days of house tours, a $15 savings to all events. Citywide, the collection of Alexanders range from 1,225 square feet in the Racquet Club Road Estates at the north end to over 2,500 square feet in the Vista Las Palmas, Golden Vista, Mountain View, and Green Fairway Estates nearer to the center of town. These were originally priced from $16,950 to $50,000. Today, the Alexanders are highly sought after and refurbished sells from $400,000 to well over one million dollars.